The Beanstalk Fund offers a portfolio of investments in select Colorado nonprofit social enterprises. Like the quality leaders we’ve sought for the Beanstalk Foundation, all Beanstalk Fund recipients demonstrate skill, dedication, community focus, compassion, and strong leadership. The Beanstalk Fund provides advice and funding to Colorado nonprofits that are bridging the gap between business sustainability and social impact. The Beanstalk Fund partners with these nonprofits to build those bridges. The Beanstalk Fund applies an evergreen philosophy that recycles investment dollars from one nonprofit social enterprise to the next. There is a lack of funding, and capital structure positioning available to Colorado social enterprises. 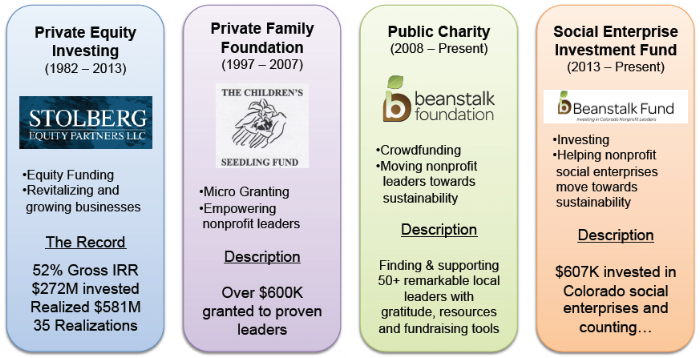 The Beanstalk Fund fills that vacuum, enabling growth for organizations that fall between available funders. Mission: Recycling electronics and other materials to create local jobs for people with autism and other disAbilities. In 2015, Blue Star partnered with PCs for People to bridge the digital divide. Impact: Acquired certifications that enabled Blue Star to receive government e-waste recycling contracts. Allowed hiring of business development director to head expansion efforts. Mission: To bridge the digital divide by providing the necessary tools to put a functional computer into the hands of low-income individuals and families and get them online. In 2015, PCs for People partnered with Blue Star Recyclers. Impact: Provides subsidy funding of refurbished computers to be distributed to qualifying students in Denver schools. Mission: CCDC advocates for Social Justice for people with all types of disabilities. Impact: Funded creation of social enterprise law firm, Probate Power, under CCDC to focus on helping families in the establishment of special needs trusts, handling legal services and preparing wills. Mission: As an impact-oriented social enterprise, their mission is to bridge the gap between legal needs and legal access with affordable, high quality legal services. Impact: Enables Bridge to Justice to hire a second senior attorney who will expand case load and allow Executive Director to focus on fundraising, marketing, and potential expansion to Denver. Mission: Shambhala Mountain Center is an educational nonprofit organization whose mission is to serve as a contemplative center for the exploration of individual and societal wisdom. Impact: Enables development and implementation of online social enterprise platform. Allows SMC to connect with global community. Mission: Through high-caliber professional development and hands-on learning in a Prodigy enterprise, youth from low-income communities in Denver build skills, social capital and understanding for success in the new economy. Impact: Enables Prodigy to engage other funders, and establish relationship with Allegro Coffee Company. Funds startup costs for physical coffeehouse location. Mission: Belay Enterprises is a faith-based nonprofit organization that creates businesses to employ and job train individuals rebuilding lives from addiction, homelessness and prison. Impact: Enables purchase of new headquarters for Belay and Bud’s Warehouse. Build out and business expansion funding. We have over three decades of leader-first investment experience.